Ive had a look at teaching resources and found that it is much harder to find English instruction over Anglo. Does anyone have any advice on where to find more English based tuition and am I limited in having an English. I was hoping to learn sea shanties and english folk tunes, is the English suitable for this. Welcome aboard! It helps us give advice/locate help for you if you tell us where in the world you are located (or add it to your profile, in which case it will appear by your name). There is a lot of info we can show you. It's especially good if you read music, which I guess you probably do. When you start to feel familiar with where things are on the instrument (and in spite of what you think now, there will come a time where you can dive for a button that's far away, and hit it) then playing by ear will have become more comfortable. The next step is to listen to what your favorite players do, and try to do that. English concertina is fine for what you want. I play trad tunes and songs and find EC great for this. The thing to watch for when playing tunes is that you attack the notes quickly and also take your finger off sharply so that the notes are clear and well separated. Not doing this tends to smear the melody and then the tune lacks definition; this is what gets EC a bad name when players do not take care. I second mdarnton's recommendation of Alistair Andersons workshop. 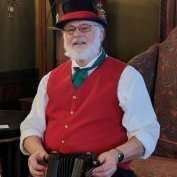 I highly recommend the Frank Butler tutor for EC beginners, and as I recall it's available as a free download at concertina.com. My focus is English and nautical folk music. I switched from AC to EC years ago and have been happy. I think the EC is more versatile for this purpose. She's also an excellent tutor. Alistair Anderson's book is also excellent. The thing to watch for when playing tunes is that you attack the notes quickly and also take your finger off sharply so that the notes are clear and well separated. Not doing this tends to smear the melody and then the tune lacks definition; this is what gets EC a bad name when players do not take care. IMO this is good advice - I tend to imagine that the buttons on my EC are glowing red hot to help me hold them down long enough ensuring I release a button in good time - adjusting of course depending on the demands of the music being played and the note duration.